Weekend means it's a perfect time to chill out and do things you like most. 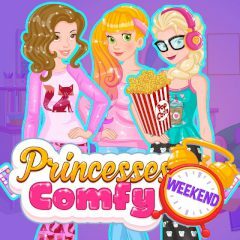 Create comfortable conditions for princesses, so they can watch their favorite movie! Princesses will never stop chilling and this weekend is special, because they will do a new thing. This is a race and you will complete several things with them before it is over. What do you think it will be?